A hand held veggie snack, popular with kids. Preheat the oven to 150c, gas mark 2. Whiz the spinach in a processor until finely chopped, then mix it with the cheese. Spoon this mixture over half of each tortilla. Scatter with the peas, onion and coriander, including stalks. Fold over the tortillas and press down to seal; brush with some oil. Cook the folded tortillas in batches. Heat a griddle or frying pan on a medium heat and cook the tortillas oiled-side down for 3 minutes until crisp. Brush the uncooked sides with some oil, flip over and cook for 2 minutes. Keep warm in the oven while you cook the rest. 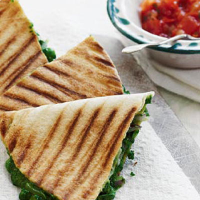 Cut into wedges and serve with the tomato salsa.